Just like English speakers in the Caribbean sound different from English speakers in England or the U.S., Caribbean whales have a distinct regional accent. 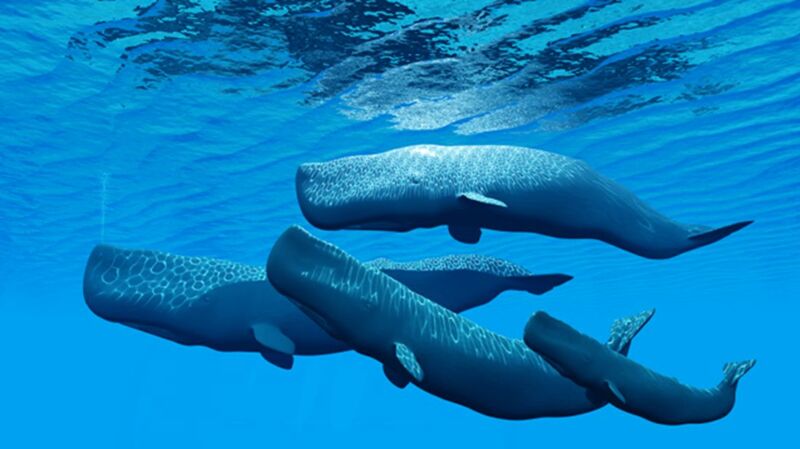 A new study on whale vocalizations published in the journal Royal Society Open Science shows that Caribbean sperm whales all use a certain acoustic pattern that’s not heard outside of the region. Over the course of six years, researchers led by Shane Gero of Aarhus University in Denmark listened to whales swimming along the west coast of Dominica, an island just north of Saint Lucia and Barbados. They recorded calls, also known as codas, from nine different social groups. Then, they categorized the clicking vocalizations—which sound kind of like morse code—determining which patterns were consistent across the groups. Some, they found, were highly varied and unique to individuals—their own calling card, similar to a name of sorts (though that doesn’t mean the whales necessarily make them specifically for that purpose). Other call patterns were used only within the membership of one pod. But the most common coda was heard across all the whales, no matter what age, size, or social unit. Different from the acoustic calls of whales in the Pacific Ocean, this call acts as kind of a regional accent. All the whales performed this call—described by the researchers as sounding like a “click-[PAUSE]-click-[PAUSE]-click-click-click”—so identically that the researchers couldn’t identify which whales were making which sounds. These exact codas were made by all the social groups in the study, and have long been heard in Caribbean whales. The researchers write that they "have dominated repertoires in this population for at least 30 years,” as observed in previous studies. Though the “1+1+3” rhythm of the call has never been observed in Pacific whales or in other areas of the Atlantic, even the youngest whales from the eastern Caribbean made them in the same way, suggesting that it’s a culturally learned call.